This pretty little kitty has such an on point fashion look that even the Kardashians feel so last year when they see her! With her super soft gray fur accented with subtle orange stripes, and her striking golden eyes, she’s a stunner alright. Is a reality show in Smoke's future? A line of luxurious cat accessories? A supermodel contract with Cat Fancy? Well, while all of these things could be a possibility for our fancy, fab feline, the girl with the gorgeous face would much rather live a more down-to-earth life style. A purrrson to play with, toys to claim as her very own and maybe a decorative cat carrier would make Smoke a happy girl. A shy, quiet lifestyle is what this girl seeks, none of that chaos of the paparazzi: all that noise, flash and hounding scares her a bit. 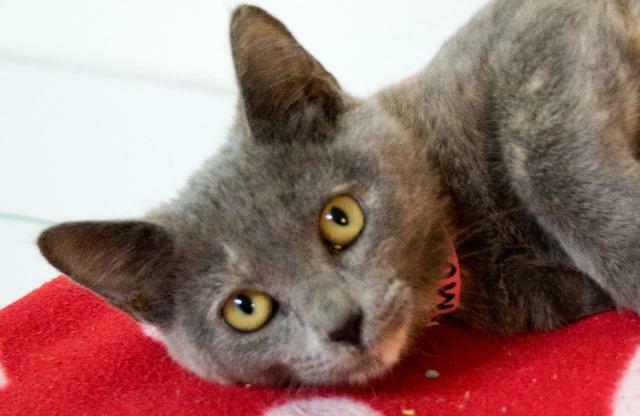 Smoke only wants the limelight that you will shine on her, so come and take her home today.